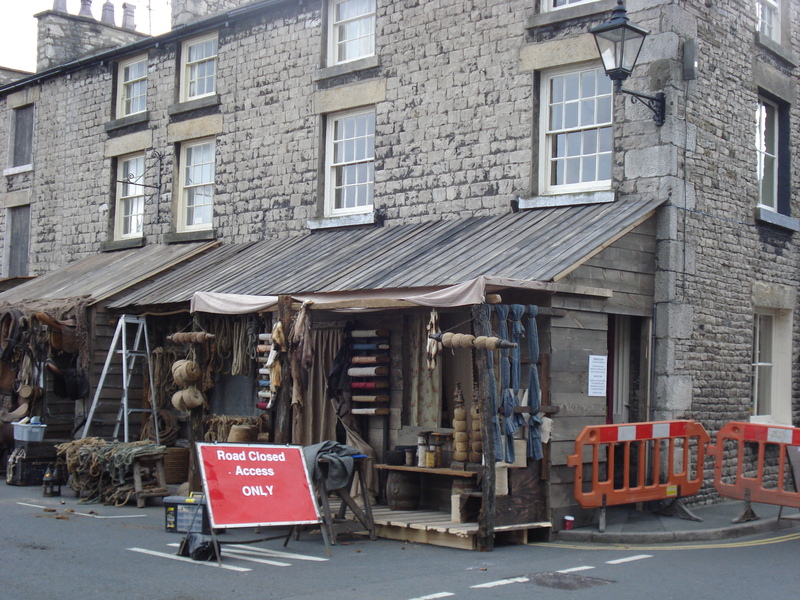 Our town, set between the Yorkshire Dales and the Lake District, was taken back to 1820s Cornwall for the filming of scenes for the BBC’s ‘Jamaica Inn’, to be presented as a three-part serial sometime next year. The buildings are apparently the right colour for Launceston. Each day brought intriguing new developments. 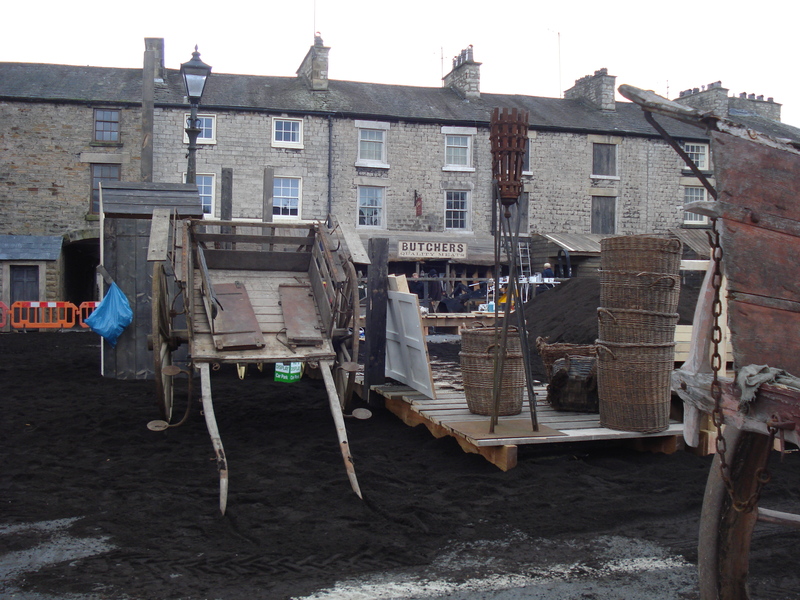 Firstly, the square was filled with piles of artefacts in shades of dull brown – market stalls, barrels of rum, brooms, braziers, baskets, carts and coffins. Two days later they were spreading rich dark earth over the lines for the parking bays, building new frontages in wood for the shops and cafés on the south side of the square and erecting a neat little wooden shed to hide the ‘Pay and Display’ machine. 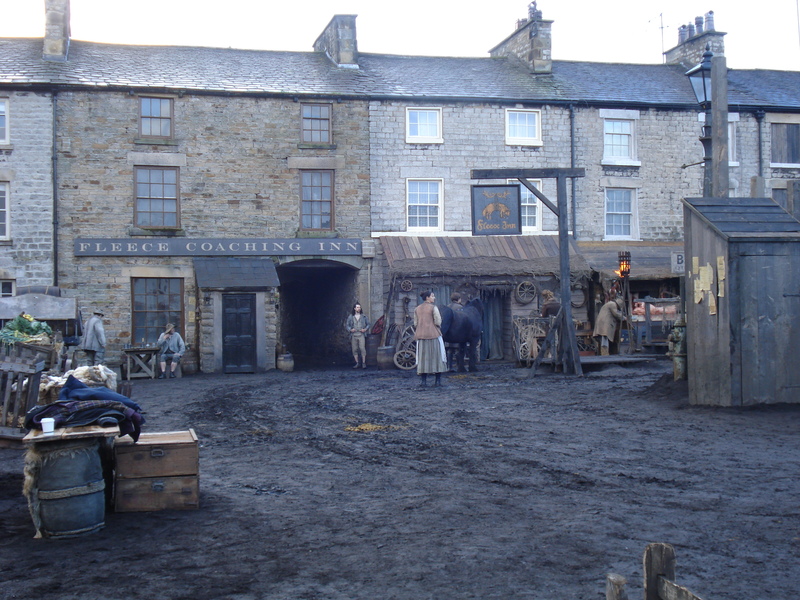 The estate agent became the Fleece Inn, and the local hotel became the Customs and Excise Office. Like many in the town, I couldn’t keep away. 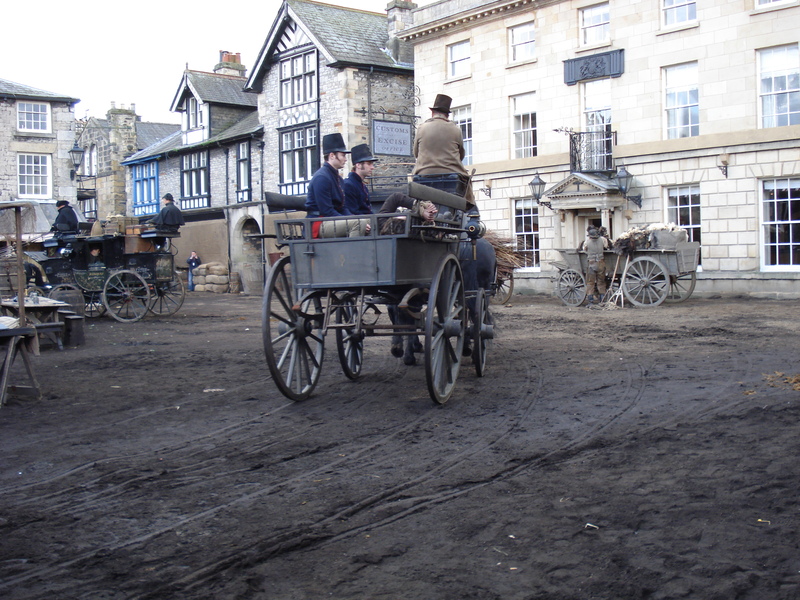 On Monday they brought on horses and carriages, and there was a glimpse of Jessica Brown Findlay, reincarnated after her death as Lady Sybil in ‘Downton Abbey’, passing in the Bodmin Fly. 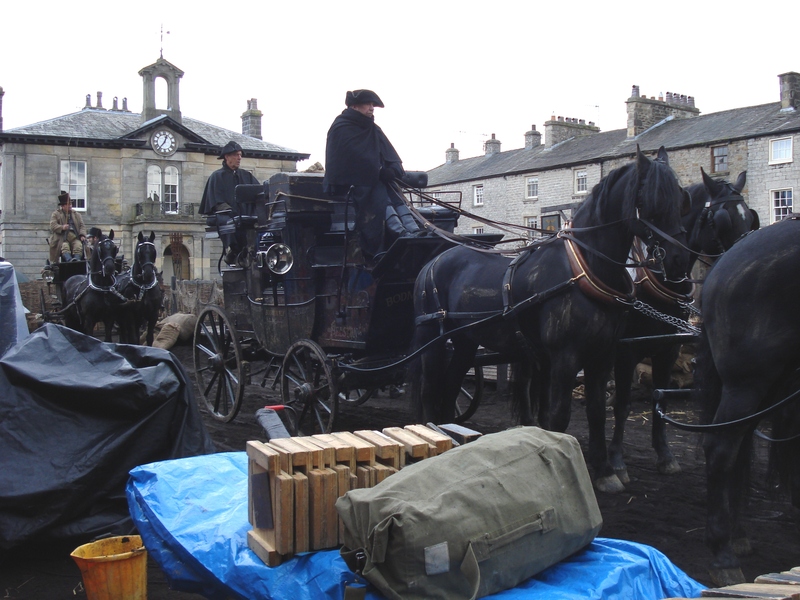 Then on came the actors, smoke machines and rain machines, more horses and some geese. 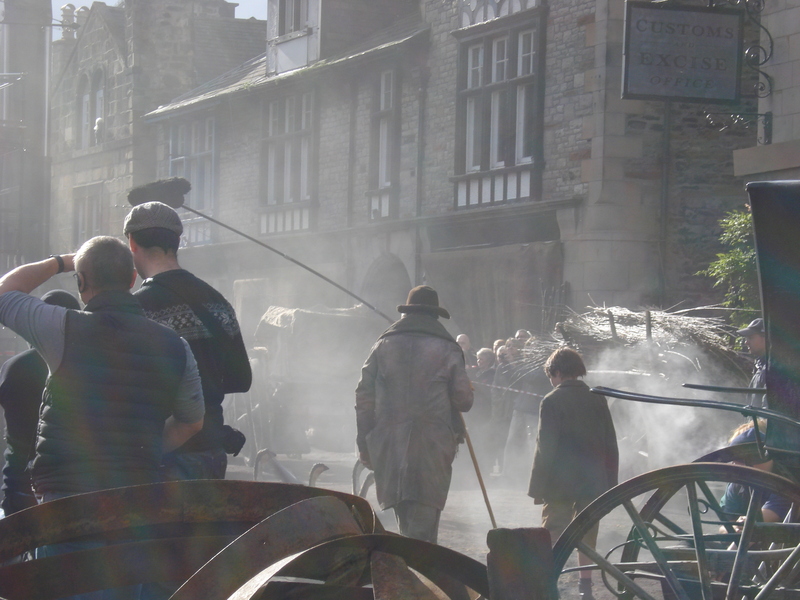 Fifty local extras stood around in the cold waiting for their moment – as did the main actors, of course. The horses were equally patient. The crowd watched and chatted and wondered. More community spirit was engendered than on any other day of the year. In a similar way, I posted a picture of the set on my Facebook page and found it was one of the top posts of the year for ‘likes’. I began to wonder about this. Is it because it takes us out of our reality, as any piece of fiction does? Is it because of the draw of ‘celebrity’? Do we want to be able to travel back in time? Do we want to be ‘in a story’? 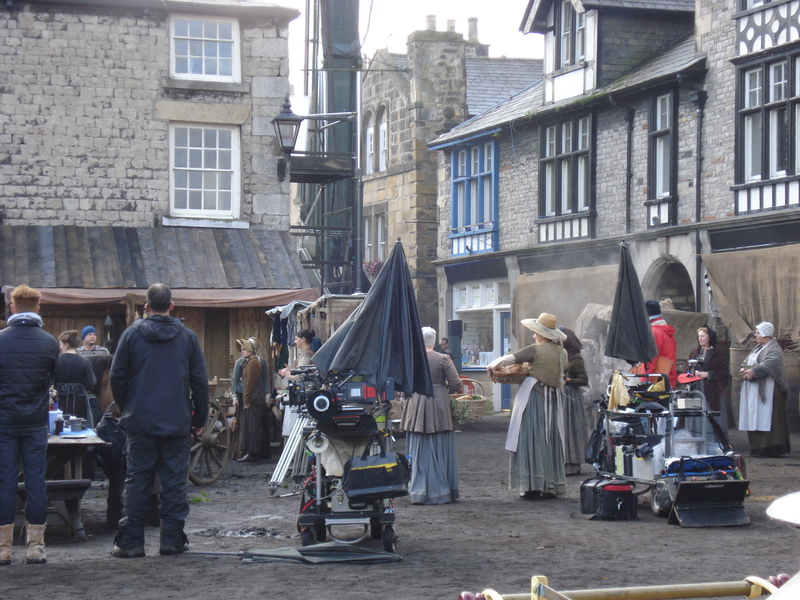 Do we just enjoy those moments of incongruity, such as the innkeeper on his smartphone between takes? Whatever it is for each individual, it led me to reflect on the great power of stories in our lives. Which reminds me I really ought to be getting on with my first short story assignment for my OU course. But perhaps I’ll go down and check on the filming first. On Sunday I headed off to spend the day with some people I’ve met ‘in the computer’. We know each other quite well, but before Sunday we’d never met face to face. We’re a group of six originally from the Facebook group for the Open University’s ‘Start Writing Fiction’ short course in 2011. We then set up our own online forum to exchange writing ideas and critique each other’s work during A215, the OU’s next Creative Writing course. We’ve supported each other through short fiction, poetry and life writing, each beginning to find her own direction. We’ve had humour and pathos, family stories, historical fiction, travel writing, free verse, sonnets and much more. And we’ve enjoyed it so much that we’ve all signed up for A363, Advanced Creative Writing, which kicks off this week. I think it was Ruby from Wiltshire who first suggested a ‘real’ meeting. Our locations range from Essex to Cumbria, so all roads led to Birmingham, where Giselle kindly offered us hospitality. We had plans to workshop some new writing, perhaps read a short play or produce an unconventional poem. 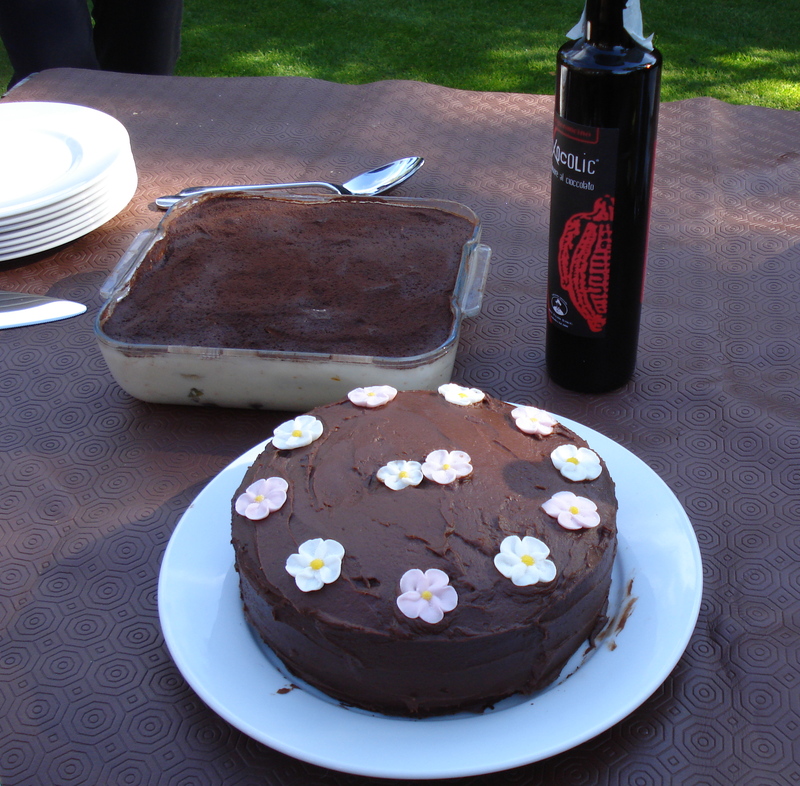 Then gradually, insidiously, the menu planning took over…. So what was it like, meeting for real? I’d say that meeting and sharing our work online meant that we really did know each other quite well. The surprises came in things like accent, the timbre of the voice, or our heights. Some of us were so much smaller than we expected. In fact, we didn’t pick out Viola for ages on the station platform, because we expected her to be very tall. It’s a bit like imagining a character in a book and then finding they look different in the film version. Oh, and after the unexpected bonus of a long, al fresco lunch on a warm October day, we did settle down to some writing chat and air our ideas about writing the first assignment, due on October 31st. I wonder who’s going to write about food.